As Facebook turns 10 Tuesday, Pew Research Center released a treasure trove of facts about the social network, including one that debunks the theory that Facebook has a teen problem: 73 percent of U.S. Internet users between the ages of 12 and 17 are on the social network. Some users dislike certain aspects of Facebook, but fear of missing out on social activities (or “FOMO”) isn’t one of them. Their dislikes start with oversharing by friends, and people posting one’s personal information (such as photos) without first asking permission are among the most common. Parents are especially protective of images of their children, as 57 percent of Facebook users with children under the age of 18 say that people posting pictures of their children without asking permission first is something they strongly dislike about using Facebook. On the other hand, the “fear of missing out” phenomenon resonates with only a small proportion of the Facebook population. Just 5 percent of Facebook users strongly dislike the fact that Facebook allows them to see others taking part in social activities that they themselves were not included in, and 84 percent of users say that this aspect of Facebook life doesn’t bother them at all. 57 percent of U.S. adults are on Facebook. 64 percent of Facebook users visit the social network on a daily basis, up from 51 percent in 2010. 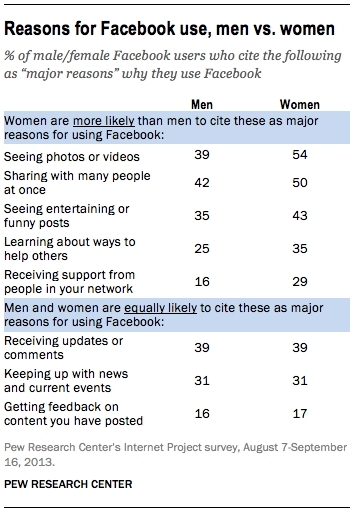 Reasons for using Facebook differ between men and women (see chart below). 47 percent of respondents said photos and videos from friends were a major reason why they use the social network, while 46 percent cited the ability to share with several people simultaneously, and 39 percent apiece mentioned updates from friends and humorous content. 39 percent of adult respondents had between one and 100 Facebook friends, while 23 percent had 101 to 250, 20 percent had 251 to 500, and 15 percent had more than 500. The average (mean) number of friends is 338, and the median (midpoint) is 200, meaning that one-half of users of the social network have more than 200 friends, and one-half have under 200. 27 percent of Facebook users aged 18 through 29 have more than 500 friends, while 72 percent of users 65 and older have 100 or fewer. 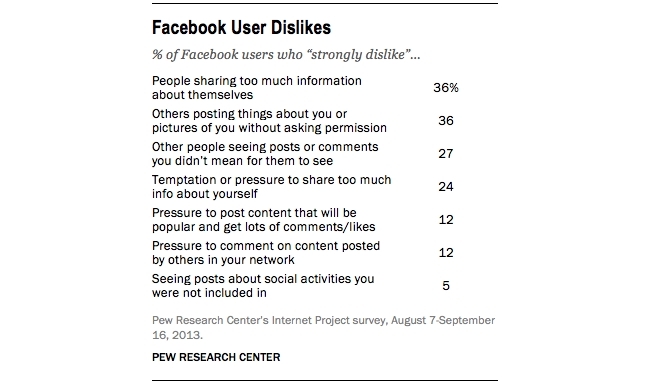 19 percent of respondents 18 through 29 have had someone ask them to unfriend another user, while that number drops to 10 percent for users 30 through 49, 7 percent for those 50 through 64, and 5 percent for those 65 and older. 35 of those unfriend requests came from other friends, while 23 percent came from current spouses or romantic partners, and 12 percent from former spouses or romantic partners. 38 percent of the requests involved friends, while 22 percent involved former romantic partners. 44 percent of Facebook users like content posted by their friends at least once daily, and 29 percent do so several times daily. 31 percent comment on photos daily, and 15 percent do so several times per day. 19 percent send private messages to friends daily, and 10 percent do so multiple times every day. 10 percent update their statuses daily, while 4 percent do so several times per day, and 25 percent never update their statuses. 52 percent of Internet users who are not Facebook users said someone else in their household has an account on the social network, with 66 percent of parents who are not on Facebook responding the same. 24 percent of non-Facebook users have looked at photos or posts on the accounts of Facebook users they live with. Readers: Did any of Pew’s findings surprise you?